In response to the above statements, Prime Minister of the Carnalismo Brown Berets, Victor San Miguel asked that the web admin post his statement on the slanderous, lies as put out on Facebook. “This is Victor San Miguel. I wish to clarify that a video that was taken down recently, was taken down only for respect and sensitivity toward the family of Rudy “Hasbro” Rivera. If was for this reason only that I asked to have the video taken down. This statement is also to clarify that Carnalismo stands alone, and we stand together. Carnalismo, and all chapters as well as all members of Carnalismo also stand behind Ricky Gonzales and Brian “Chuco” Felix, as Brown Berets, as members of the Carnalismo Brown Berets, and as Prime Ministers operating in their home states. We also stand be behind rosemary martinez as well. i didn’t have the honor of knowing Hasbro but I respected the man. 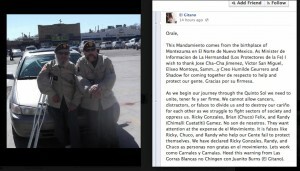 he was a true warrior of La Causa, and for this reason ALON I asked them to take the video down. This is the first time that I have spoken and given my message on the website (Facebook). It will be my last. May Carnalismo be judged by what work that they do in their communities. We have no time for fighting amongst ourselves in public. If you have proof in paper about any person – brown beret or not then please put it out there. If not…if its your opinion keep it to yourself. I respectfully wish to uphold the dignity of all Brown Beret members, regardless of patch. This entry was posted in BBNO, Brown Beret National Organization, Brown Berets, Infiltrators, Saboteurs, La Hermandad, Los Brown Berets, Official Statements and tagged Corrupt, El Gitano, Jon Burns, Juanito Burns, Justice, Lies, Slander, Truth by Staff. Bookmark the permalink.